Gandhinagar, Gujarat's capital city, rises on the west bank of the Sabarmati River, about 30 kms. North East of Ahmedabad, the commercial and cultural heart of Gujarat. Gandhinagar presents the spacious, well-organized look of an architecturally integrated city. Gandhinagar, a well-planned city, stretches into 30 sectors into which the city has been divided. 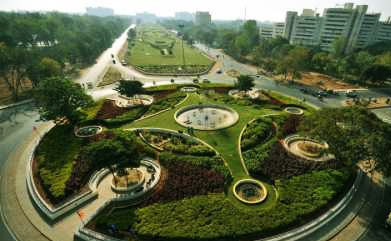 Apart from this there is a generous provision for wide-open green parks, extensive plantations and a large recreational area along the river giving the city a lush green garden-city atmosphere. The Gandhinagar-Ahmedabad area, is known for the renowned Indian Institute of Management, National Institute of Design, Indian Space Research Organization, Physical Research Laboratory, Institute of Plasma Research and Entrepreneurial Development Institute, amongst others. Further, Darpana Academy, Calico Museum, LD Institute of Indology, Sabarmati Ashram, Akshardham and Kadamb Institute are among the well-known Cultural and Arts Centers. Infocity, an upcoming IT park in Gandhinagar is in the vicinity of the SPT. Overall, the architectural marvels, recreational centres, entertainment zones, malls, all located in the midst of fascinating greenery with a blend of cosmopolitan excitement and countryside allure provide an ideal environment for learning.